We are a second generation family owned and operated business since 1959. Our 6 housekeeping cottages and 57 seasonal trailer sites are situated on the beautiful shores of Clear Lake. Clear Lake is part of the UNESCO World Heritage Rideau Canal. Located between Chaffey’s and Newboro Locks. Fishermen and boaters have access to 6 other lakes on the same water level. Our long standing guests, enjoy swimming, fishing, boating, water sports, beach volleyball, hiking, cycling and relaxation. Also, within a short drive from Green Valley you can experience golf, live plays, concerts, shopping, dining and so much more, in towns and cities such as Westport, Gananoque, Perth and Kingston. To the north of us, Ottawa, our nations capital, is only 90 mins. away and to the west of us, is delightful, Prince Edward County. 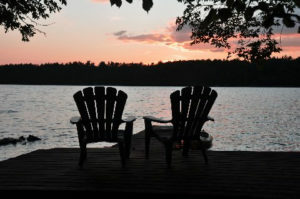 Our cottage season opens on the second Saturday in May (pike) and closes, October 1.